The 100ml Dorica Bottle has a traditional Mediterranean look that is made for showcasing all your oils and vinegars in their full glory. The 100ml Dorica Bottle has a traditional Mediterranean look that is made for showcasing all your oils and vinegars in their full glory. Fill with olive oils and balsamic vinegars and place on tables in your restaurant or to bottle your own range of speciality salad dressing and drizzles for the mass market! The long, flat sides of the 100ml Dorica Bottle make it very easy for you to add your own branding in the form of labels and stickers if you so desire. This bottle is compatible with our 31.5mm closures, including the black pouring cap, which is ideal for pouring oils and dressings. This lid has an integrated thin funnel which gives you more control about the dispensing of your product and it is also tamper evident, giving retail customers peace of mind about the quality of their purchase. The 100ml Dorica Bottle is suitable for use with a variety of our 31.5mm closures, including screw caps and pourer inserts. 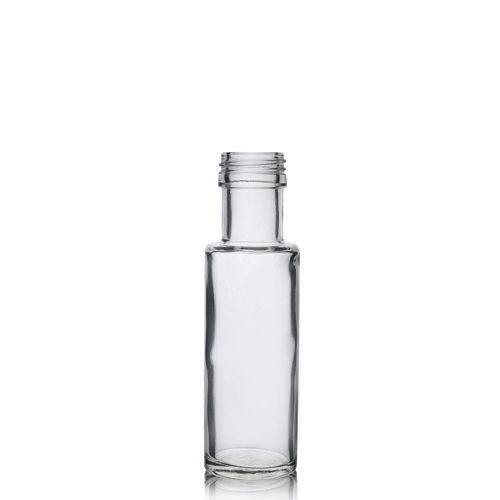 This listing is for the bottle only, however you can find the cap of your choice in our closures category and buy separately, or navigate to one of our bundled bottle and cap listings in the Food section.